News outlets reported yesterday that Marshall has been hit with a suspension that should expire on February 7th and “The Rhino” will have to retake the failed test although no comment has been made by commission officials. 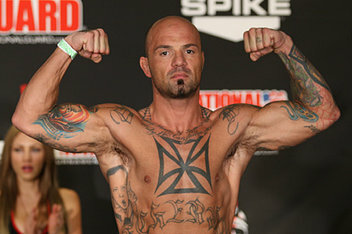 MMAJunkie.com reports that Marshall was granted a therapeutic-use exemption for testosterone-replacement therapy prior to Bellator 98 but Marshall ultimately withdrew from that fight with a broken hand. It was a good run to the top for Marshall as he won two fights in the Season 8 tournament with first round knockouts. The loss to champ Schlemenko was his first under the Bellator banner. He is a former WEC champion and was on a four fight winning streak prior to Bellator 109.